Kim and Russ have worked with many new managers and gotten a sense for the challenges of transitioning from an individual contributor role into a management one. Russ tells a story about two managers he worked with. They had both been exceptional individual contributors, and when they became managers, both got it pretty wrong. But they were at opposite ends of the spectrum — one was all about driving results, while the other focused too much on being nice to the team. Russ talks about the issues that both ran into as new managers. Next, Kim and Russ answer a listener question. 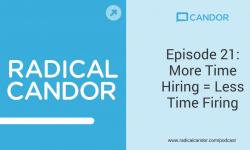 The listener is considering a transition to a manager role within their existing company and is wondering how to smooth that transition with their current peers and boss. Kim and Russ recommend approaching this by asking questions and listening. They suggest several questions, and emphasize learning from and showing empathy for those people. You need to ask people for help more often. The listener also asks for advice on what to do when peers are prone to gossip. Essentially… don’t tolerate it. Talk to people, not about people. The episode ends with tips you can start using right away. Tip 1: Distribute important responsibilities to the people on your team. Tip 2: Make sure there are clear goals for the team and each individual. Tip 3: Give criticism when it’s needed. Tip 4: Show up for your weekly 1:1s. Get the full explanations for these tips by listening to the episode. 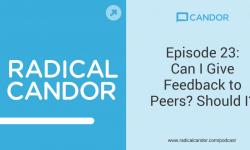 Get help putting the Radical Candor ideas into practice with our new (free!) iOS app, Candor Coach. 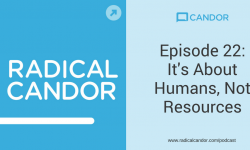 Check back next week for a new episode of Radical Candor. next post: Podcast Episode 15: What’s Your Body Language Telling Me?